Just a few things I learned while making the Decade Coins with 5th grade. 1. Kids are WAY more creative and better at Tinkercad thank I am. I have always had trouble visualizing things. I can not picture how furniture should look in a room. I actually have to see it in there or move it around. 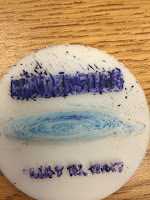 I had a very difficult time making a sample coin to show 5th grade. I was worried how the kids would be able to connect the different shapes to create what they wanted or if they would get frustrated. They were much faster and much better at combining the shapes than I was. 2. There are different kinds of filament. Who knew? Not me. My 3D printer came with a role of filament and when I was running low, I emailed the vendor that the printer was purchased from and asked him for a quote on white filament for the Afinia printer. He sent it and I bought it. 3. Different filaments have different settings on the printer. When I loaded it and printed for the first time the coin would NOT come off the raft. It was stuck on there like super-glue. I thought maybe I had messed up the calibration or the nozzle height so I reset those and printed again. Still stuck. I emailed Afinia support - which is great by the way. They sent back some instructions and still stuck. I went through the whole set up one more time and happened to notice a drop down in front of ABS and remember seeing something about ABS filament. I looked at the filament that I loaded and it said PLA. I changed it in the drop down and presto-chango, worked like a charm. 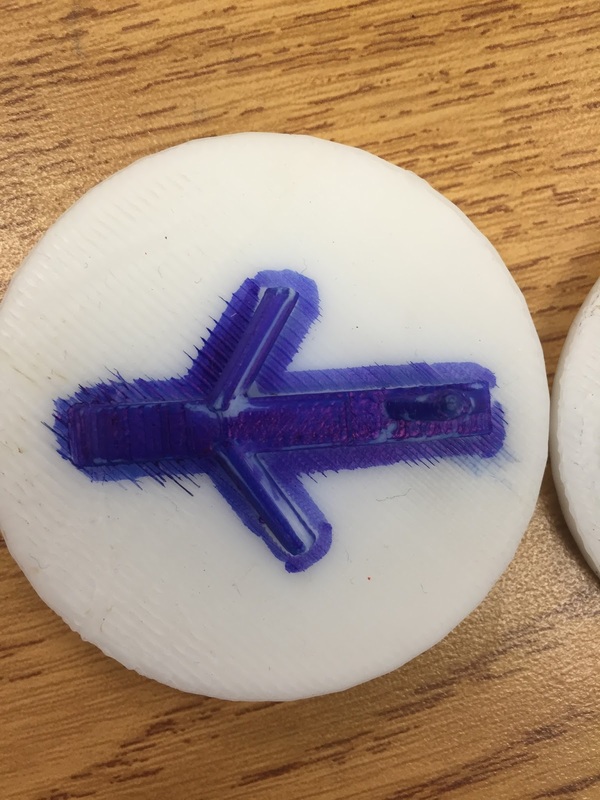 I really don't know what the difference is between the ABS and PLA but I found this article if you are interested. 4. Different filaments take coloring differently. After I made my sample coins, I tried coloring them with Sharpie marker. 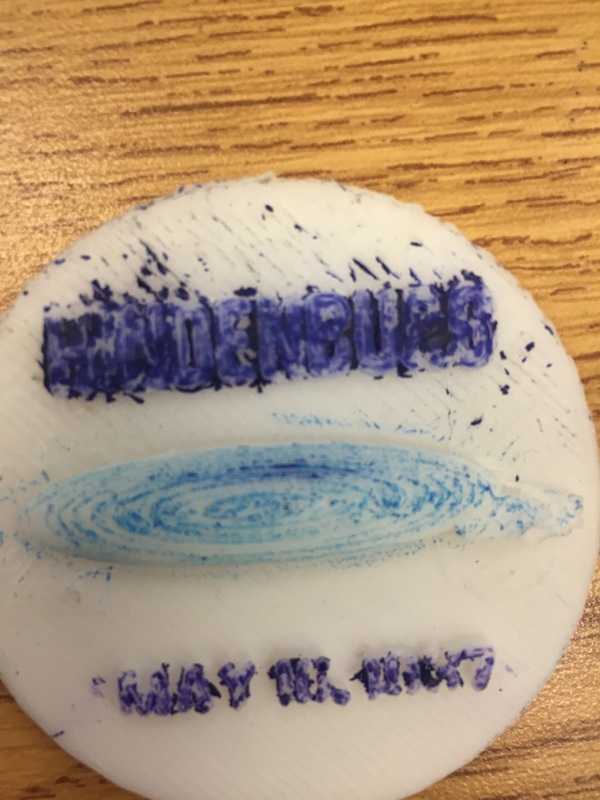 Keep in mind this was on the ABS filament - no good. The marker bled and looked horrible. Crayons were no good either. Colored pencils worked great on the ABS filament. Once I loaded the accidently PLA filament, the Sharpie markers looked awesome! The PLA is a little shinier and maybe seals better so the sharpie doesn't bleed. Still waiting on the correct filament. Class in the middle of the Blokify project kind of got shafted. At least the water wheel got printed. GT teacher did it. I like these coins, though. That was a good idea.